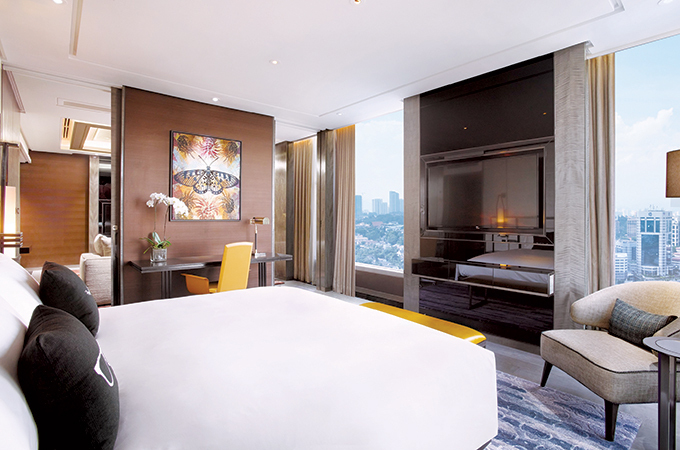 The doors to one of Kuala Lumpur’s most anticipated hotels opened last month with the unveiling of Sofitel Kuala Lumpur Damansara, the brand’s first hotel in Malaysia. Located in the heart of affluent Damansara Heights, the luxurious 312-room Sofitel Kuala Lumpur Damansara is part of an 8.5-acre integrated development by GuocoLand, comprising two luxury condominium blocks, two corporate office towers, the hotel and a lifestyle mall. Designed by Wilson Associates, the hotel’s interior blends the local heritage with a sophisticated feature wall depicting the country’s Wau Bulan, otherwise known as the moon kite with French art vivre through an Eiffel Tower sculpture. Stunning art-pieces and sculptures were specially created for the hotel paying homage to the rich Malaysian and French heritage and culture. Ranging from 43 to 105 sq m, the guestrooms feature the signature bedding concept by MyBed, wi-fi and a selection of premium in-room amenities by Lanvin and Hermès. Guests staying in suites will have access to the Club Millésime executive lounge which offers spectacular views of the city’s skyline and provides exclusive services including complimentary breakfast, all-day refreshments, evening cocktails and more. Home to five restaurants and bars, the signature all-day dining restaurant Kwee Zeen serves Pan-Asian cuisine while the Chinese restaurant Wan Chun Ting, which translates as Ten Thousand Springs Pavilion, offers authentic Cantonese and Imperial cuisine with intricate fabrics, fine embroidery and gold damask velvet. For conventions, weddings, and corporate events, Sofitel Kuala Lumpur Damansara boasts six meeting rooms including a pillar-less 1,100 sq m ‘Wau Bulan’ Ballroom that can accommodate up to 800 guests. Wellness and leisure facilities include an outdoor pool, So Spa and So Fit. Featuring five treatment rooms, sauna and steams, guests can luxuriate in signature So Spa facial and massage treatments. The spa is also the country’s first to offer a Moroccan Hammam bath treatment. Strategically located midway between Kuala Lumpur and Petaling Jaya, Sofitel Kuala Lumpur Damansara is within walking distance to the Pusat Bandar Damansara metro station and 55 minutes to Kuala Lumpur International Airport.